The greatest works of art—be they composed or brewed—offer new views of the world around us. Today we’re sampling a beer and an opera that show the dark side of law enforcement. Mags and Seb recently sampled this Lagunitas masterpiece by splitting the 12-oz. bottle into matching wine glasses. The beer’s appearance was worthy of this dignified glassware: thick foam clutched the glass, and sparks of orange flickered on the brew’s body. The high alcohol content of the beer offered a soothing finish to a stressful day. The beer is packed with contradictions. It smells like both the brown bread baking in your grandma’s kitchen and the Phish t-shirt hanging in your uncle’s closet. It tastes like a cocktail of sweet peaches mixed with tart grapefruit and sprinkled with brown sugar. Its most prominent feature is the lasting bitterness that dominates the finish. But somehow the contrasting flavors and aromas fit their bold voices into a pleasing harmony. This beer is delicious. 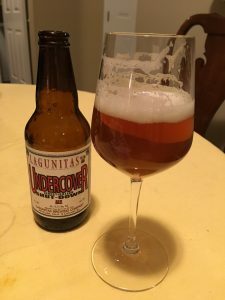 Beers get their bitterness from hops, but this Lagunitas ale also owes its bitterness to a run-in with law enforcement. The “Undercover Investigation Shut-Down Ale” is named after an event now known as the “St. Patrick’s Day Massacre” to brewery insiders. Before it became a brewing behemoth, Lagunitas hosted parties at its Petaluma brewery every Thursday at 4:20 p.m. As the time suggests, marijuana frequently appeared at these events. The party on St. Patrick’s Day 2005 was particularly epic—one of the guests used a sushi roller to make a massive joint. Like all good things, the 4:20 parties came to an end. An undercover agent from the California Department of Alcoholic Beverage Control was at the St. Patty’s festivities. He tipped off police, who raided the brewery. Lagunitas briefly lost its license. After it got the license back, it permanently banned pot from the brewery. That’s the short version of the story. The longer version is even more entertaining, and it’s the subject of the video below. Watch it and understand the lingering bitterness that inspired the beer. Composer Gregory Spears and librettist Greg Pierce based their opera Fellow Travelers on the 2007 novel of the same name by Thomas Mallon. The Cincinnati Opera premiered the work in 2016, and the Chicago Lyric Opera staged it again this March. Fellow Travelers tells the love story of two men in Washington D.C., one a young reporter and another a State Department official. It also has much in common with the Lagunitas ale. Like the Lagunitas, the opera encompasses contradiction. The opera is scored for a modest chamber orchestra, but it occasionally references the extravagant music Wagner wrote for massive orchestras. The action is set in the recent past (1950s Washington D.C.) and addresses current topics (LGBTQ rights), but the music draws inspiration from medieval melodies. Spears modeled the gorgeous aria “Our Very Own Home” after the jongleurs, itinerant minstrels from the Middle Ages. Also like the Lagunitas, Fellow Travelers looks at the damage that law enforcement can cause. The opera depicts the “Lavender Scare,” which Judith Atkins describes in an article in the U.S. National Archives and Records Administration’s Prologue magazine. Atkins explains, “Beginning in the late 1940s and continuing through the 1960s, thousands of gay employees were fired or forced to resign from the federal workforce because of their sexuality.” The name Lavender Scare demonstrates that the oppression of gay workers was connected to the contemporaneous anti-communist fervor of the Red Scare. We won’t spoil the opera by sharing how these scares shaped the fate of the drama’s protagonists. Recently, the FBI has been dominating American news. This week, the agency’s former director, James Comey, published his autobiography, A Higher Loyalty. On the day of the book’s release, a pensive Comey appeared on the NPR talk show Fresh Air. He repeatedly referred to the institutional interests of the FBI. His words and the title of the book show that Comey believes that defending these interests is noble. And as the agency takes action that could harm the Republican president, more and more Democrats are subscribing to Comey’s vision of a beneficent FBI. Fellow Travelers yanks viewers out of the shallow reactions of the political news cycle. It reminds them that the institutional interests of the FBI have included the persecution of the powerless and the systematic enforcement of bigotry. But it also provides a visceral reminder of the damage that citizens can cause when they stop seeing each other as people and start viewing each other as caricatures. The opera both increases viewers’ awareness of horrible actions by the United States and exemplifies respect for the flawed yet usually decent people who work within the government. A good beer issues its own call to empathy. We look for complexity in an American ale; why not look for the same in our fellow Americans? Partisan politics have no time for the depth of opera and beer. Diehard Clinton Democrats still see Comey as the biased loudmouth who cost their candidate the presidency. Meanwhile, Trump Republicans see Comey as another of the turncoats who lie simply by contradicting their Leader. We’re withholding judgment and crossing our fingers for an Election 2016 opera. If nothing else, an enterprising brewery could make a killing on a “Lordy, I Hope There Are Tapes” lager. Get BachBeer in your inbox!